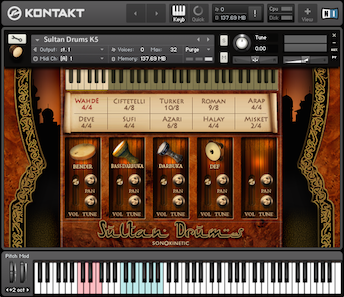 South America and specifically Brazil have a glorious musical heritage and that part of the world has been high on our wish-list to be “Sonokinetic-ified" into playable Kontakt instruments. To start off with, we tackled the backbone of that tradition - the percussion ensemble. For this product’s production we started with recording a vast collection of traditional Brazilian percussion instruments in our renowned MCO studio hall in The Netherlands. To get the playing techniques of these beautiful instruments just perfect, we enlisted the support of a South American music expert. The final stage was recording them with lots of round robins, velocities and multiple microphone positions. The sound of these instruments is very visceral, joyful and powerful at the same time. They emanate the warmth and playfulness of the musical tradition they stem from, making these recording sessions a truly mesmerizing experience that we look back on with joy. We were so glad to experience that this feeling translated through the editing and production process and remains omnipresent in the final product. 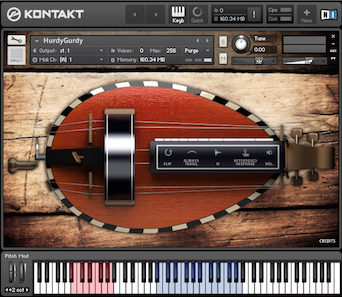 This is a player’s instrument that can inspire and brings a liveliness to your digital world. It feels good and sounds good, and that’s what it’s all about. 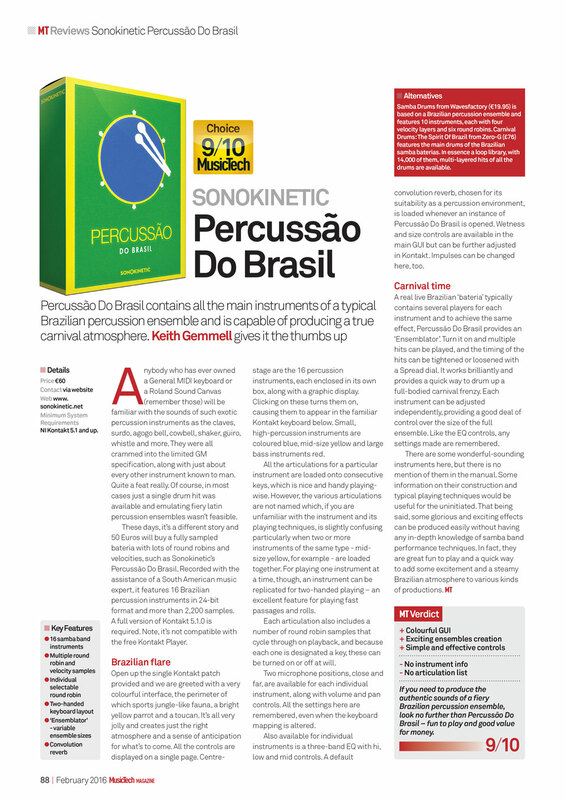 In true Sonokinetic style, with this development and production we focused on authenticity and flexibility to offer you, the user of “Percussao Do Brasil”, many options to configure your instrument to your needs and wishes. This diverse collection of Brazilian percussion instruments will inspire you and bring that extra vibe or sound to your productions you’ve been looking for. 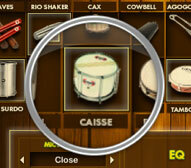 Whether you’re creating an authentic Bateria ensemble for your samba ,or just need a unique sound addition to your DAW-percussion template, we believe this instrument will fill that gap. With a beautifully crafted themed user interface designed by Ryo Ishido, we are very proud and pleased to present to you the next line in our traditional music cultural heritage, “Percussao Do Brasil” - Traditional Brazilian Multi-sampled Percussion. 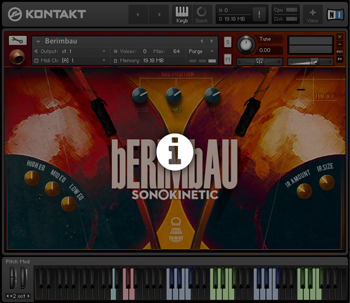 Sonokinetic ‘sticks’ with its unbeatable pricing module and high quality sampling, we are really happy with how Percussao turned out and we hope you will share in our enthusiasm for this instrument and it brings you a broad smile every time you play it. 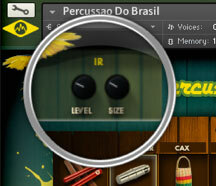 We’re proud to release “Percussao Do Brasil”, delivering a realistic sounding samba band at your fingertips. 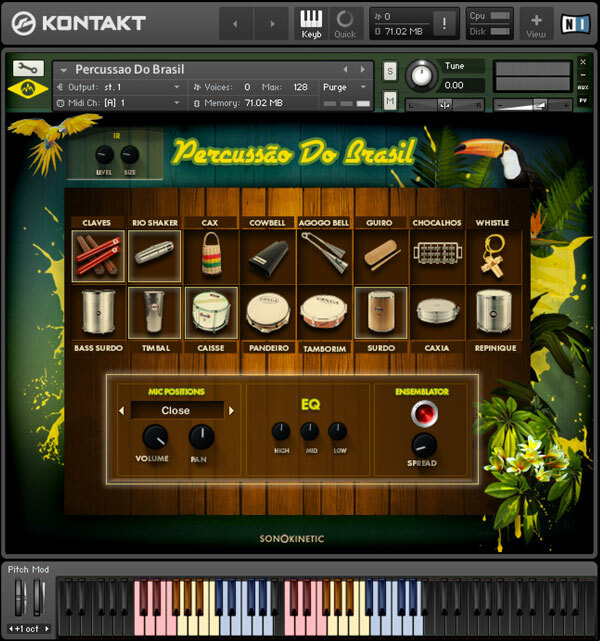 All of the controls for Percussao Do Brasil are featured on the main Kontakt UI. These include: instrument selection, convolution reverb, mic selection, EQ and “Ensemblator”. The number of trigger keys available for each percussion instrument will vary, depending on how many articulations are available. 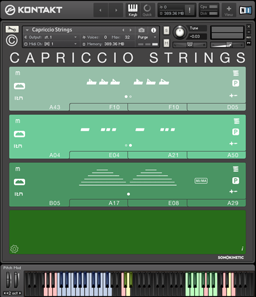 It is possible to load several different instruments at the same time. The trigger keys will simply continue up the keyboard as you load more instruments. Two-handed mode will load onto the keyboard twice - more on that later. The EQ section, shown here, allows you to quickly and simply tweak the levels of the low, mid and high frequency levels. Simply click and drag. Cmd / ctrl click to reset. 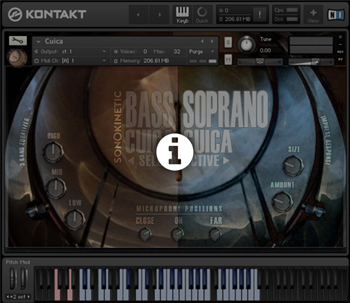 Each instrument can have completely independent EQ settings. These settings will be remembered, even if you re-arrange the keyboard mapping of the instruments. The instruments of Percussao Do Brasil have been sampled individually. In a real-life samba band there would be several people playing identical instruments. We’ve made it easy to emulate this within the interface with the “Ensemblator”. Using this control will automatically play multiple hits. Turn on/off by clicking the button. The timing of the hits can be tightened / loosened with the SPREAD dial. 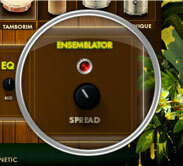 Each instrument can have completely independent Ensemblator settings - this allows you to adjust the size of your virtual samba band to your taste. These settings will be remembered, even if you re-arrange the keyboard mapping of the instruments. Note that the Ensemblator can only be used with the mid and large snares / drums (the bottom row of instruments within the interface). Percussao Do Brasil comes preloaded with a convolution reverb sampled from an actual space to simulate a realistic ensemble percussion environment. This control makes it easy to quickly dial in some realistic reverb without too much fuss. Adjust the wetness and size of the reverb by click-dragging on the dials shown here. Ctrl / cmd click to reset the levels to default. The instruments of Percussao Do Brasil were sampled with two different mic positions: Close and Far. 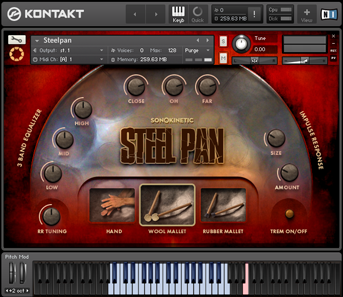 This section the interface gives you control over the mixing and panning of those positions. 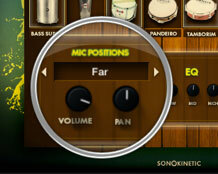 Use the left / right arrows to select the Close or Far mic controls. Adjust the level and panning using the dials shown here. Ctrl / cmd click to reset the dials to default. Note that you can set completely independent levels and panning for each instrument - and these settings will be remembered, even if you re-arrange the keyboard mapping of the instruments. The recording of each instrument articulation includes many round robin samples. In normal playback these will cycle through, each time they are played. If you want to, you may exclude certain round robin variations from the cycle using the upper MIDI keys from E4 to C5. Each key represents an individual round robin sample. Play a key with low velocity to turn that variation off, high velocity to turn it on. The MIDI key at D4 will reset the round robin cycle to the beginning.